If you're a Facebook user (of course you are, who am I kidding right ? ), chances are not too long ago you were screaming to your friends (in facebook, of course) to stop sending you all those apps invites (read: farmville). But now, since I use less and less of facebook and more of twitter, something annoying comes in the form of foursquare. Twitter (read: twitter) : A cool way to tell all your friends (followers) what smart phone you are using by the mean of using the appropriate apps (Twitter for iPhone, Twitter for Blackberry), what you are doing, what you are feeling (please don't), cool cool stuffs that you encounter, or simply telling jokes in 140 words or less. 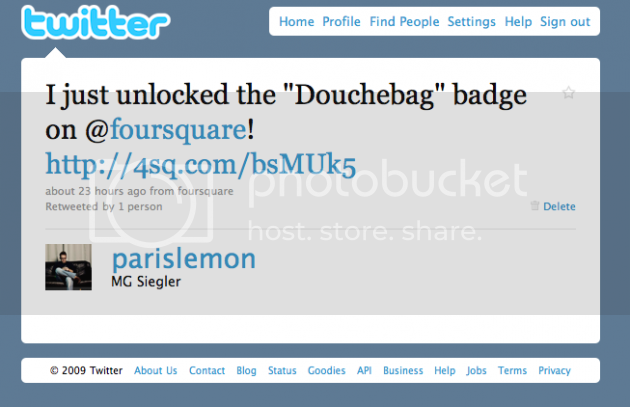 Foursquare (read: lame) : Show people what a douche you are. Simply LAME. First of all, I am not your parole officer, so I DON'T CARE whether you just checked in to starbucks or you just become a mayor of the North Pole. Secondly, don't you think checking-in to your own house is pathetic, dangerous and it's like shouting to everyone pleaserobme.com when you check-in to another place. 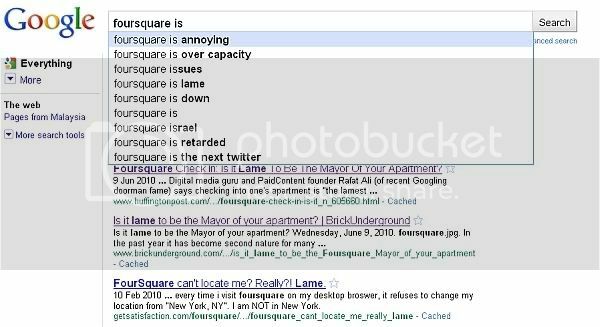 Thirdly, everyone is a self-important prick to some degree, but frequent foursquare posts (especially you link foursquare to twitter to facebook) show that you are a shameless self-important prick. A douchebag. So in conclusion, no one cares where you've been (maybe some stalkers), how often your'e there. You may even spend a lot of time in your local McD, it doesn't make you the mayor of McD, it just makes you fat.